Contemporary with early imperial Rome, the Meroitic civilization flourished along the fertile banks of the Nile River in the land of Kush in what is now the Sudan. This African dynasty traded not only with Egypt to the north but also with Greece, Rome, and peoples of the Near East. Consequently, official Meroitic art reflects the absorption of external influences adapted to serve local rulers. Arikankharer belonged to the black royal house of Kush, whose capital was at Meröe. 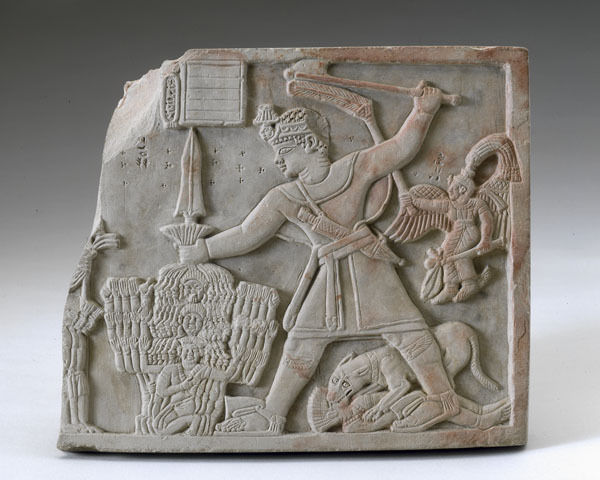 Although the crown prince died before he could come to power, this superbly carved, raised relief shows him as a vigorous, victorious conqueror. Behind him floats a female Winged Victory, brushing away flies, while between his legs a vicious dog mutilates a fallen enemy. As the prince's father, King Natakamani, imported sculptors from Egypt, the work is hybrid in nature. Distinctly Meroitic in style and detail are the compact proportions, round head, curly hair, oversized eyes, flabby neck, and broad shoulders of the prince as well as the portrayal of fear in the faces of the vanquished. The imperial stride, the smiting pose, and the convention of showing the body in profile are attributes assimilated from Egyptian art.